John Cullerton heads into 2019 presiding over one of the largest and most diverse collections of Democratic senators in Illinois’ vibrant 200-year history. Over the course of his tenure as Senate President he has built a reputation for calm leadership and pragmatic consensus building. Never was this more evident than in 2017 when he and then-Republican Leader Christine Radogno joined forces to offer a bold, comprehensive solution to the state’s lingering budget impasse. That impasse nearly ruined Illinois’ credit rating, cost thousands of people their jobs and led to thousands more leaving the state for school or employment elsewhere. Together, Cullerton and Radogno paved the way for a bipartisan deal that broke the budget stalemate and set the stage for economic recovery. That eye toward bipartisanship has been a hallmark of nearly every major accomplishment to come out of the Senate since Cullerton became the Senate President in 2009. It was first evident in an impeachment trial that resulted in a unanimous vote to remove a governor from office. Similar bipartisanship was shown in leading the way on marriage equality, abolishing the scandal-plagued death penalty system, restoring McCormick Place’s economic power, delivering savings through Medicaid reforms and overhauling public education funding. Through it all, Cullerton has emerged as an outspoken advocate of all that is good in Illinois and a tireless consensus builder in trying to resolve what is wrong. Now, entering a new era of state government with a new, Democratic governor, Cullerton continues to stress a shared sense of urgency for Republicans and Democrats working together to make Illinois better. His top goals for the coming year include an overdue investment in state infrastructure and re-focusing job training programs to meet employers’ needs and put thousands of people to work. 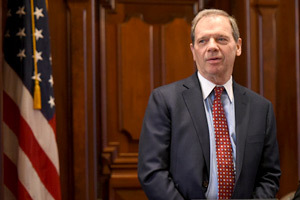 A native of Chicagoland, Cullerton earned a bachelor's degree in political science from Loyola University in Chicago, as well as a Juris Doctor from its prestigious School of Law. He began his legal career working in the Cook County public defender’s office. He is currently a partner with the law firm of Thompson Coburn. His legislative career began in 1978 when he was elected to the Illinois House. In 1991, he was appointed to the Senate to fill the seat vacated when the trailblazing Dawn Clark Netsch became the first woman elected statewide. Before being elected Senate President by his peers, Cullerton’s legislative career focused on traffic safety and public health. He was the lead sponsor of the state’s child seat and safety belt laws and has been an outspoken advocate for efforts to reduce smoking. Cullerton and his wife, Pamela, have five children and three grandchildren.